FROM HIGHWAY 26, TURN EAST ON WEST SHARON AVE. ON WEST SHARON AVE CONTINUE 1 BLOCK TO RAZORBACK DRIVE. TURN RIGHT (SOUTH) ON RAZORBACK DRIVE. THE SOCIAL SECURITY OFFICE IS 1/2 BLOCK DOWN RAZORBACK ON THE RIGHT. 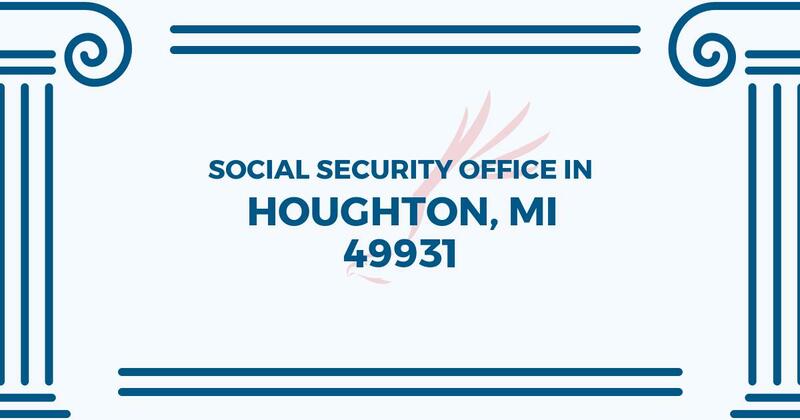 The Houghton Social Security office is located in Houghton 49931. The following page includes information for this location like the office phone number, hours of operation and driving directions. If you have any interests or comments about your retirement benefits or are interested in making an appointment, call the following Houghton Social Security office. The Houghton Social Security office is located at Houghton 49931. The Michigan SSA provides different federally run plans like retirement, SSI, Medicare and disability benefits. The following page contains essential contact information for this location such as the Social Security office phone number, hours of operation, and driving directions. If you have any issues or inquiries about your retirement Social Security benefits or interested in scheduling an appointment, call the following Houghton Social Security office.